Wood, Frank Watson (1862-1953). Watercolour signed and dated 1939 (LR) and annotated along the bottom HMS SOUTHAMPTON, HMS GLASGOW and RMS EMPRESS of AUSTRALIA. It was in the early spring of 1937 that the Governor General of Canada, Lord Tweedsmuir (better known as the author John Buchan) suggested that the new King, George VI, should make a tour of Canada; and when the Canadian Prime Minister, Mackenzie King, came to London for the Coronation in May 1937 he formally proposed such a visit. President Roosevelt went further: he suggested that the Canadian tour should be combined with a visit to the United States. All parties were in agreement and plans went ahead accordingly for the King and Queen to make the visits in the summer of 1939. War clouds were daily growing blacker over Europe which although threatening the very idea of such a plan, did introduce a new imperative which the American President was keen to exploit: the British Royal Family on American soil would send a clear message that the two English-speaking nations were in harmony. But such was the concern in Britain over the deteriorating international situation that spring of 1939 that the Admiralty was not prepared to sanction the battle cruiser HMS REPULSE (Captain E J Spooner DSO RN), who was to have acted as royal yacht for this voyage, deploying out of home waters and she was replaced by the Canadian Pacific liner RMS EMPRESS OF AUSTRALIA (Captain Archibald Meikle MN). At the wish of the King, conscious of the disappointment caused in REPULSE who had been heavily involved in all the preparations, the battle cruiser was allowed to remain in the Royal Squadron for the first leg of the journey westwards. No stranger to Royal tours - the EMPRESS had carried HRH the Prince of Wales to Canada ten years earlier - she was to be escorted this time by two ships of the 2nd Cruiser Squadron, Home Fleet (Vice Admiral G F B Edward-Collins CB CVO) who was flying his flag in HMS SOUTHAMPTON (Captain F W H Jeans RN); and HMS GLASGOW (Captain C G B Coltart RN). Whilst the two cruisers were alongside in Portsmouth prior to the Royal Squadron’s departure on 6 May 1939, train truck loads of gold bullion from the Bank of England were covertly loaded aboard. The cruisers' working parties found the cases remarkably heavy for their size and may have guessed at their contents which were bound for the vaults of Fort Knox and safety from the coming war in Europe. It was sign of just how dire the authorities in Britain considered the international situation to be. And another highly valuable crate was loaded aboard one of the two cruisers too: one of four precious original versions of the Magna Carta (this one from Lincoln Cathedral) which was first bound for the New York World's Fair at which it was to take pride of place. Subsequently when the Fair was over and the British pavillion dismantled in October 1939, the Magna Carta was moved to the Library of Congress when Britain decided that it was too valuable to ship back across the Atlantic now that Britain was actually at war with Germany. After the USA entered the war against Japan in 1941 the Magna Carta was moved again, this time to Fort Knox where it joined the British gold bullion with which it had journeyed across the Atlantic in the first place aboard one of those two Royal Escorts back in May 1939! Having experienced unseasonably rough weather for the first few days of the voyage the Royal Squadron then ran into thick and persistent fog which lasted for three full days and threatened seriously to disrupt the finely honed royal schedule ashore in Canada. But the fog eventually cleared on 14th May and found the ships amongst spectacular icebergs and floating sea ice. Frank Watson Wood, the Artist on Tour with the Royal party, has painted this scene vividly in another picture in Maritime Prints’ collection (MP 029) : although well into his seventies he seems to have been painting fast and furiously as there are at least some half dozen watercolours in the poublic domain of the maritime aspects of this 1939 Royal Tour, this one of SOUTHAMPTON and GLASGOW escorting The King and Queen in icy waters being another. 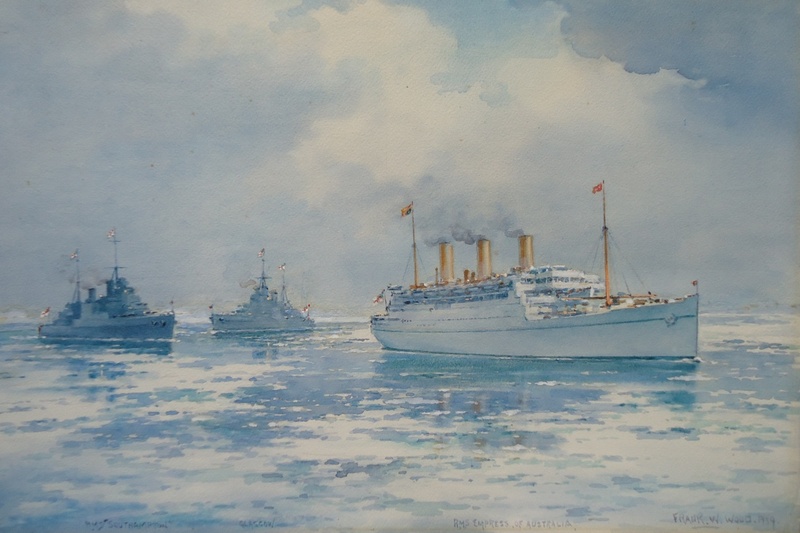 Frank Watson Wood had only recently been commissioned by the King to paint scenes from the Coronation Fleet Review of 1937 (see MP 045 and MP 046) and the King’s evident satisfaction with these paintings probably led to him being asked to accompany the Royal party on this tour. The form was that all his work would be submitted to HM on completion of the tour and once the King had selected those he wished to be kept for the Royal Collection the remainder were given back to the artist for use as he wished. Thus, this watercolour appears to be one such painting the artist was allowed to keep and we know that there is a sister work to this one (and several others of this Tour by Wood on this website) in the Royal Collection at Windsor (Accession RI 22685). EMPRESS OF AUSTRALIA was an interesting bird! Originally named TIRPITZ and built in Stettin for the Hamburg-Amerika Line, this ship would have been the finest vessel on the South American passenger run had it not been for the outbreak of World War 1. Although she was launched some 9 months before its outbreak her completion was continually delayed and hampered and it wasnt until November 1920 that she was fit to go to sea and by then she had been nominated as a war reparation for Great Britain (see also under "HMS BENBOW" on this site where SS ZEPPELIN, a similar German pre-war liner, was transferred to the British in 1919/20). She briefly acted as a trooper but was then sold to Canadian Pacific who gave her the provisional name RMS EMPRESS OF CHINA. After a major refit in Glasgow during which she was converted to oil burning, she left Glasgow on 16th June 1922 for Vancouver, and with her new name of EMPRESS OF AUSTRALIA she began scheduled sailings on the company's main Pacific route to Yokohama. Some 13 months later she was in the headlines when she rescued hundreds of people from the disastrous Tokyo earthquake of September 1923 at considerable risk to her own safety. In 1927 new turbines were installed in her and she was transferred onto the Southampton-Quebec service: her first voyage to Quebec saw her carrying HRH The Prince of Wales (later to be HM King Edward VIII and then HRH The Duke of Windsor) and Party for the Confederation celebrations. And then 12 years later she was pressed into Royal Service for this 1939 Royal Tour to Canada and the USA before becoming a troopship again in 1939. 1939-1945 saw her busy all over the world as a trooper where she - and her troops - had some lucky escapes! Post war she continued to achieve distinction as the last British troopship out of India (Bombay) and Palestine (Haifa); and then thanks to the Korean War, yet more trooping. But the shipbreakers finally claimed her in May 1952 when she was sold for scrapping thus ending a remarkably interesting and busy career: she richly deserves to be better known and celebrated and its satisfying that this painting shows her in one of those many high profile roles and proudly wearing the Royal Standard!